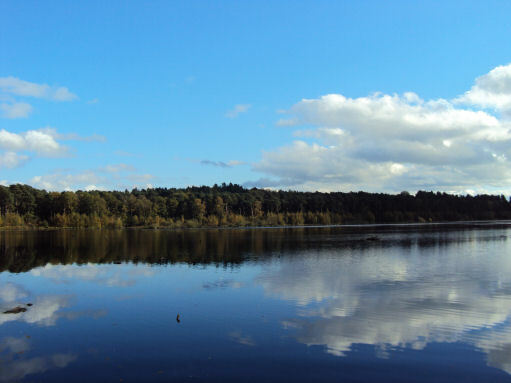 Blakemere Moss at Delamere Forest is a reclaimed wetland area. The Moss was originally formed from two kettle holes (water filled hollows formed by a detached mass of glacial ice melted in situ towards the end of the last ice age). 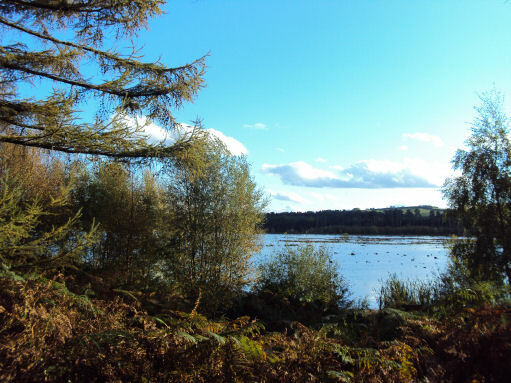 Delamere Forest is made up of more than 100 peatland basins and includes several sites of rare 'quaking' bogland, a phenomenon in which sphagnum mosses form a carpet above peaty water that appears to tremble when trodden on. The area was drained from the 1800's, supposedly by prisoners from the Napoleonic Wars and planted with trees, (mainly oak and Scot's Pine) between 1793-1815 to provide timber for shipbuilding. The Forestry Commission planted the moss with pine and western hemlock during the 1940s, which proved uneconomic. In the late 1990's the Commission allowed the area to re-flood again naturally. The restored lake now provides a habitat for wildlife, particularly birds including Greylags, Canada Geese, Black-headed Gulls, Coots, Mallards and Lapwings. It has been rapidly recolonised by rare mosses such as the orange-brown Sphagnum pulchrum as well as wildlife like diving beetles and great crested newts. Folowing the success of this project, a new project has been launched by the Forestry Commision to restore the lost meres and mosses at Delamere Forest. *Commencing at the car park at the Linmere Information Centre, follow the road to Delamere Station. Turn left at the signpost marked 'Forest Trails', and cross the bridge over the railway line. Turn right when reaching a signpost for the red trail, passing the 'Go-Ape' attraction.
.*Continue to follow the red path which runs around the edge of Blakemere Moss. At the next junction, take the track which leads away from the water and continue along, taking the path round to the left wherever there are any tracks leading off. *On leaving the trees bear to the right. Continue down this track until sighting a large signpost which leads to the visitor centre. The path will turn into the green route which leads you back to the Linmere Car Park.